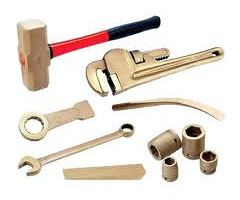 We are one of the well recognized names in the field of offering our customers Non-sparking tools. These are constructed using metal options including metal options of brass, bronze, monel copper-aluminum alloys, copper-beryllium alloys and others and assist in providing protection against possibility of fire and explosion while working in areas having concerns of sparks ignition. We can deliver these in many finish standards so as to perfectly match up with the non-sparking tool working specifications in a hazardous environment.